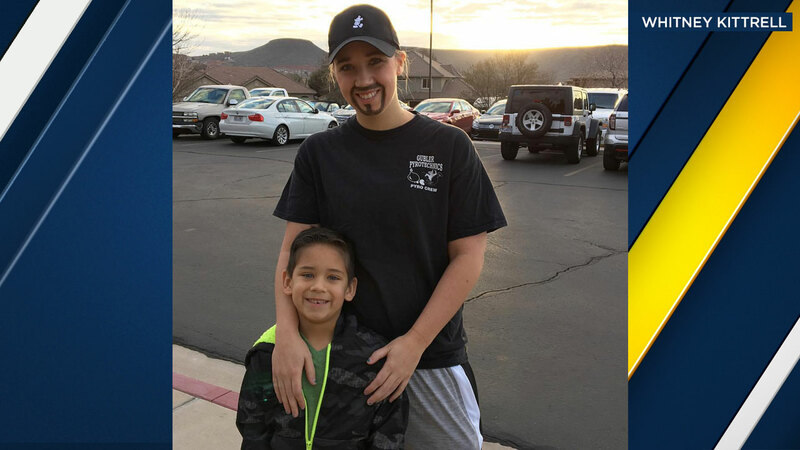 ST. GEORGE, Utah -- A Utah mother has received immense amounts of praise on social media for dressing up as a man to take her son to a "dads and doughnuts" event at his school. On Wednesday, Whitney Kittrell wrote a lengthy Facebook and Instagram post about the sweet act she did for her son. She said her child, who is in kindergarten, came home one day with a flier about the school breakfast event. Kittrell said she became a single parent three years ago, and eventually asked her son if he wanted to take his grandfather to the event. Her son told her no and that he wanted to take her because she was his mother and father. "I made a promise with myself that I would do anything I could, even if it meant going out of my comfort zone, to give my kids a 'normal' life and the same experiences as other kids," Kittrell wrote. So on Wednesday morning, Kittrell said she put on her "best dad clothes," which consisted of a hat, T-shirt and baggy sweat pants, painted on some facial hair and then headed to her son's school event. Kittrell said she felt embarrassed in her get-up during the event, but couldn't help smiling as her son introduced her to his friends. She said he told friends he brought her because she is his mom and dad. As Kittrell left the event, she said her son ran up to her, hugged her tight and whispered something in her ear. "Mom, I know that you'll always be there and do anything for me. Thank you. I love you," he told her. She said he then kissed her on the cheek and ran back to his friends. "I hope he remembers this day cause I'll never forget it or his sweet words," she said. Her Facebook post has received more than 100,000 likes and reactions as well as more than 66,000 shares.